When Augustine is born the situation in the Roman Empire is now in decline, principally for economic reasons. Since Diocletian in the 3rd century, the Emperors had tried to remake the Empire without achieving their objective. The middle classes were disappearing little by little making still greater the difference between the rich, who were continually more so, and the poor, an increasing social mass. Augustine teacher, by Ivan Lopez. Las Rozas, Madrid, Spain. Augustine’s family were a clear example of this situation. They were from the middle classes, and as years went by they started to pass through lean and difficult times financially. Saint Augustine had a brother called Navigio and a sister whose name is unknown to us. We also know that he studied with two of his cousins, Rustico and Castidiano, for he tells us in De Beata Vita. They were a family of African origin completely Romanized: they only spoke in Latin and did not take part in the nationalist movements of the time. Augustine himself would be in love with the Roman Empire and its culture. In the North of Africa as well as Latin they spoke Punic, a language unknown to the saint, whilst he was able to say a few words. Nevertheless, more than once he used the services of an interpreter to talk with the countrymen and women who did speak it. At the present time there is nothing preserved of the Punic language, which was the North-African language before the Roman Colonization and still had a place in the less colonized social settings and in rural districts. 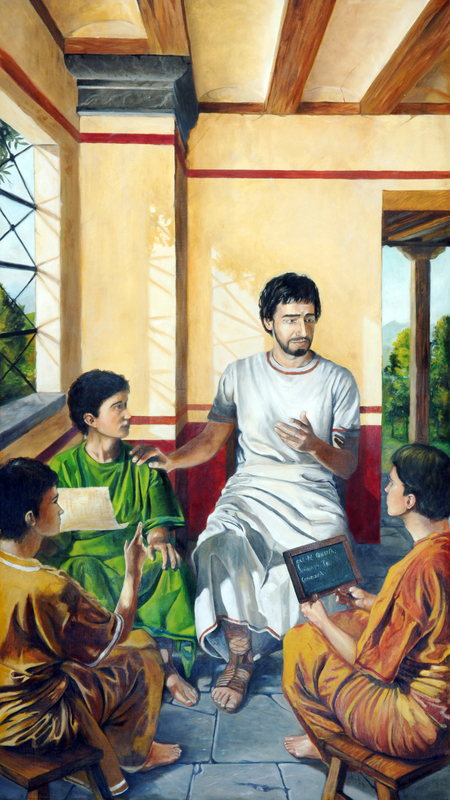 Augustine did study Greek in the school in Madura, although it is true that at the time he didn´t like it at all. It is probable that for this reason he never dominated Greek. The distance between East and West was then very great. Up until the third Century the inhabitants of the Mediterranean were generally bilingual, for as well as their own language they also spoke Greek. In Rome all of the Christian literature until the end of the Second Century had to be published in Greek, along with their liturgy. Nevertheless, little by little, Greek was reduced to the interest of cultured people. Augustine came to know it well enough to consult texts from the Scriptures, correcting the Latin texts when he didn´t like their translations and also translating texts from the Greek Fathers, St. Jerome, Plotinus and Epiphanius of Salamis. Of this last author, he did a complete translation of his work Anakefalaiosis which is one of the sources of his book Adversus Haereses.